Poor joint health is NOT just associated with old age. Myristocol PLUS supplements for humans combines four major active ingredients, and is specially formulated to support joint health, in athletes as well as those involved in less rigorous activities. 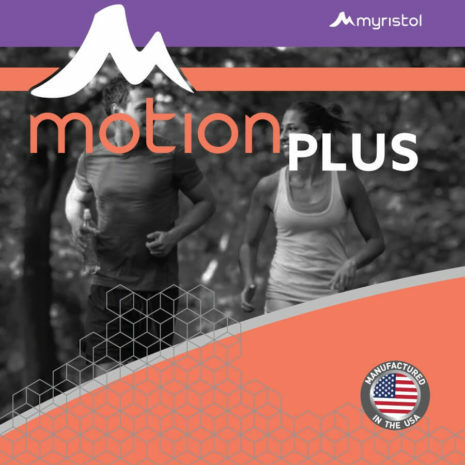 Motion PLUS joint supplements for humans combines four major active ingredients, and is specially formulated to support joint health, in athletes as well as those involved in less rigorous activities. As with our animals, poor joint health negatively impacts our mobility and our quality of life. Poor joint health is NOT just associated with old age. Motion PLUS comes in a quick dissolving capsule for rapid absorption and ease of swallowing. The content within the easily opened capsules is a vanilla flavored powder. This makes it ideal for those that have difficulty swallowing capsules or tablets, and who want to add a powder to their yogurt, smoothie or food. ALLERGY INFORMATION: This product contains glucosamine from shrimp and crab and is manufactured in a facility that processes milk, soy, and egg proteins, other tree nuts and wheat. Take 5 capsules twice daily, until desired results occur. Once results have been attained, slowly reduce the daily recommended amount until a maintenance level has been determined. The maintenance amount can vary between individuals. This product is a capsule containing vanilla flavoring so those who have difficulty swallowing pills can break open the capsules and pour the powder into yogurt, a smoothie or food.